I don't think that until you are actually pregnant, can you fathom just how much your body shape is going to change! At around 18 weeks, I started to struggle to fit into my usual clothes. Frustrated at how rapidly my options were beginning to dwindle, I struck out on an afternoon's shopping spree to Covent Garden to get myself some wardrobe staples. Unfortunately I hadn't really done my homework very well and the Gap and H & M stores there didn't stock any maternity clothes. This didn't really phase me as I just bought a few things in larger sizes than I would usually do, thinking this would totally suffice for the pregnancy! Well of course that was a ridiculous notion, because leggings that fit around a big belly also expect you to have rather large legs and so clump at the ankles. And once you have worn maternity leggings that cover and support your belly- you don't want to go back to wearing ones that sit uncomfortably halfway across your tummy! And maternity clothes are just SO much more flattering over a bump than bigger clothes for a typical body shape! What I did buy that day that have served me well though were a few bigger jumpers and some camisole tops that I wore under my usual tops for as along as I could. The extra length of the cami tops helped my usual tops look ok for a few more weeks than they would have otherwise! The below are a few pointers that I wish I had been given early on in my pregnancy. 1. Maternity leggings are a MUST. I have 2 pairs from H & M, which I thought were ok until one of my patients (who usually only wears designer clothes) told me about these ones from George at ASDA. I know, I had never bought clothes their either but their leggings are awesome and a steal at 2 for £12! I have worn and washed mine loads of times and they are still perfect! They have this pleated bit on the sides that allows more room for expansion than the H & M ones and generally just feel like better quality and are more comfortable! I also have one of their maternity swimming costumes and it is lovely! 2. Apparently you can now only buy GAP maternity clothes online. However, they do take maternity returns in store and so it's worth looking on the sale racks if they have any that have been returned,as they often just want to get rid of them! I managed to find these ones (in black) for £9,99 on the sale rack (usually £45) and the full stretchy panel that goes over your tummy make them really comfy. They have also accommodated my growing belly far better than I expected them to. 3. New Look have some nice maternity clothes and the winter coat that I bought there has been BRILLIANT. I thought I would survive the winter with just leaving my usual coat unzipped but it wasn't very comfortable and Pete joked the one day that the baby may be getting cold and so I felt really should get one! They don't have the one I bought on there anymore but I'm sure that they will have something similar again for winter. I've only bought online from New Look but I think that their bigger stores may have some maternity stock in them? The green top that I am wearing in picture 2 above is from there too. 4. H&M have quite a limited maternity range available, but everything that I have bought there has been really cheap and 'alright' quality. The pink top I'm wearing in picture 1 above is from there and was only £7. I have bought a couple of things from them as their store in Putney stocks maternity clothes (ok it's 2 rails but better than nothing) and their store at Southside shopping centre also has maternity clothes. Both of these are close to where I live so I have frequented them quite often! A good thing to know is that their maternity clothes are actually housed in their children's stores or sections. I also bought some really lovely navy trousers there last week but I can't see them online. I also bought the dress that I am wearing in this post there. I may try and get a second one from there too. 5. 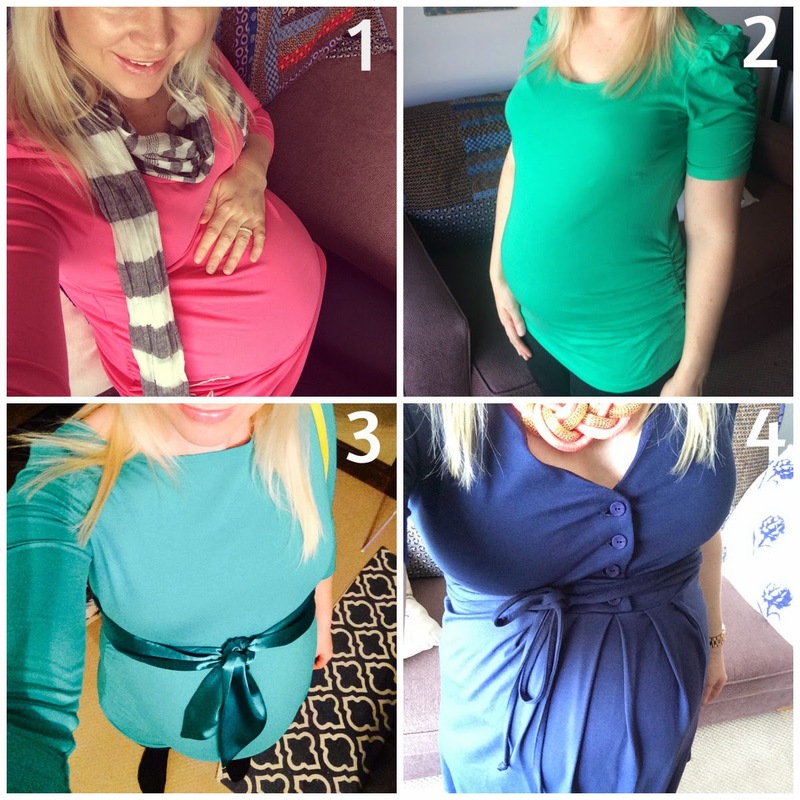 The lovely top in picture number 3 is the most expensive item I've bought thus far and I LOVE it, the navy dress in picture 4 is from the same maternity shop The Maternity Company, in Sheen. I've driven past it for years on my way to Richmond and finally popped in there a few weeks ago! They have gorgeous things there although they are more expensive (but better quality) than the high street stores above, I also bought 2 t shirts there that are breast feeding friendly (i.e. accessible) for after the baby is born. If I was going to a Wedding or smart function in the next few weeks I would definitely spoil myself with something from there! 6. Bra's. Oh my goodness I read somewhere online when I first fell pregnant that few ladies tolerate regular under wire bras when pregnant and I remember thinking that sounded quite bizarre. Well after buying bigger sizes of my regular bras I soon began to find them really uncomfortable. I have found the very cheap (£2.50!) stretchy sports bra's from Primark a life saver. I recently bought a maternity bra that has detachable straps for feeding from Mothercare (£18) and it's super. I also bought a two pack of maternity bra's from H & M for around £10 and they seem ok too. I think I will buy a few more from Mothercare in the next few weeks. Talking of Mothercare, the store closest to me doesn't stock maternity clothes, but a few of my friends have found some lovely things in their other branches! I think I need to have a further browse of their online things. 6. I have looked often on ASOS at their maternity range but not actually bought anything from them! I keep hoping that a stunning summer maxi dress is going to come up in their sale - but I am yet to find one. Anyway, I hope that this has helped a little if you are pregnant! As a general rule I would say it's safer to buy larger tops and work them with a tummy than it is to with trousers! And I am sorry that I don't have any advice for those of you that need formal work attire, being a Physio and yoga teacher I fortunately don't have to dress very smartly!